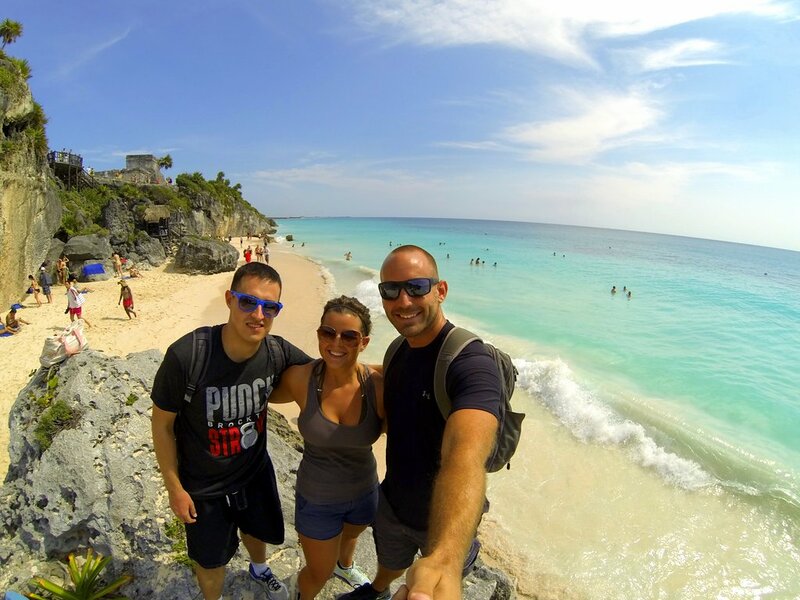 A few weeks ago, myself, Liz and my friend Billy visited Tulum, an ancient Mayan ruins site located area approximately 45 minutes south of Playa del Carmen. We had an amazing time wandering around the ruins and taking a closer look at the beautiful beach below. Thankfully, we showed up bright and early before all the tour groups arrived. 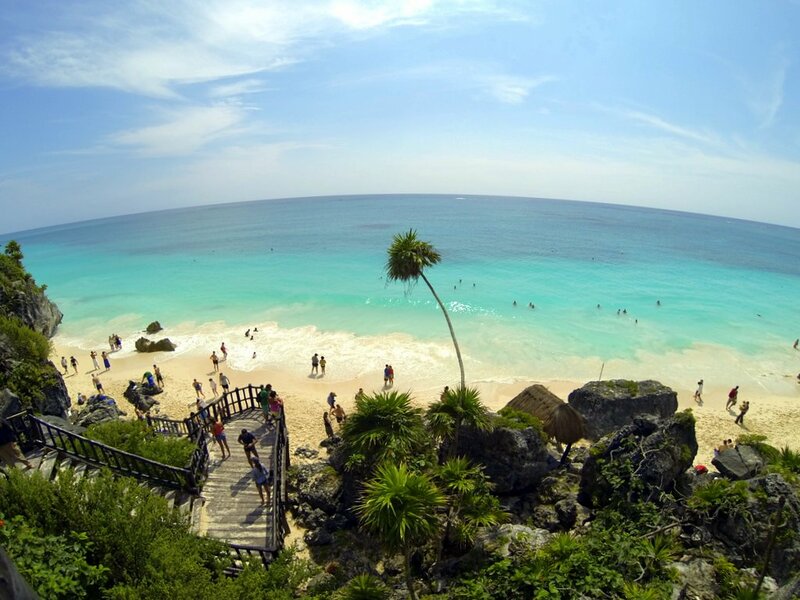 If you’re planning on visiting Tulum, be sure to get there as early as possible. Once we finished up our tour of the ruins, we looped back into the center to find ourselves smothered by tour groups and photo snapping tourists wielding large umbrellas. 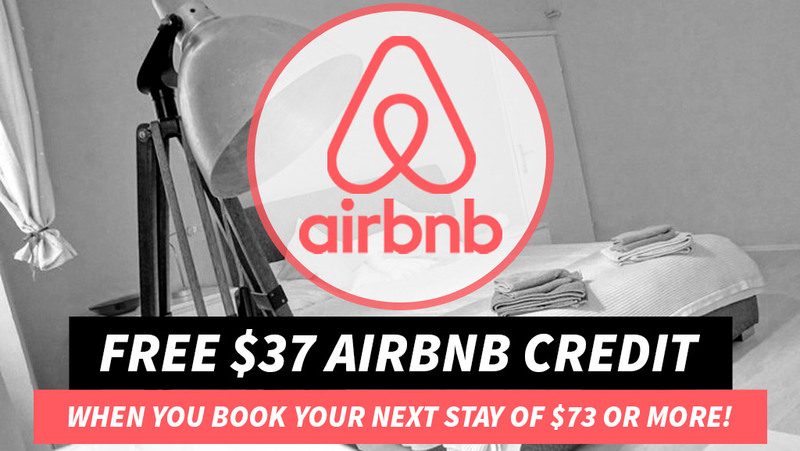 The cheapest way to get to Tulum is to take a colectivo (group taxi) from the colectivo stand located on Calle 2 Norte between Avenida 15 and 20 in Playa del Carmen. The colectivo stand is very easy to find and the process of hopping on and hopping off is incredibly simple. Hop on board one of the colectivos headed towards Tulum and tell the attendant that you want to be dropped at the “Tulum ruins” before getting in the van. 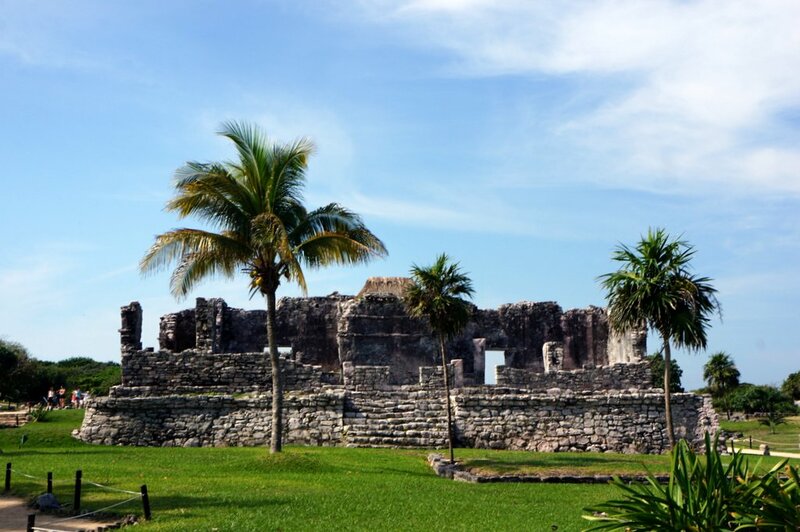 Note: You must mention that you want to get off at the ruins, otherwise you’ll be taken further south to Tulum town. The colectivo from Playa del Carmen to Tulum takes about 45 minutes to reach the ruins and costs approximately 40 pesos ($3.06 USD per person) for a one-way journey. As always, when riding in a colectivo, be ready to yell out your destination or “Alto, aqui, por favor” (Stop here, please!) just in case the driver forgets where you want to get dropped off. 1. The most economical way to get to the ancient ruins of Tulum is to take a colectivo as mentioned above. 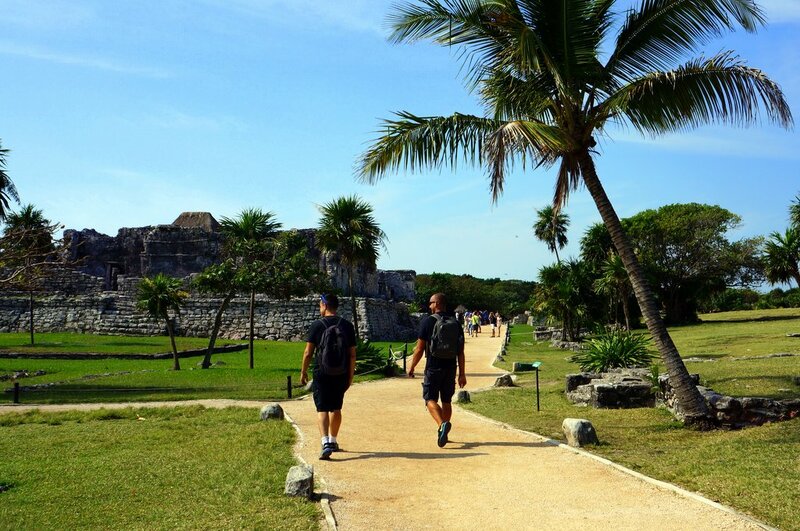 Of course, there are a variety of other ways to get to Tulum, such as the bus, a taxi or an organized tour. 2. Once you hop out of the colectivo in Tulum, you’ll notice a long stretch of road ahead of you lined with ticket vendors, tourist shops, and more. Disregard any ticket/information booth. 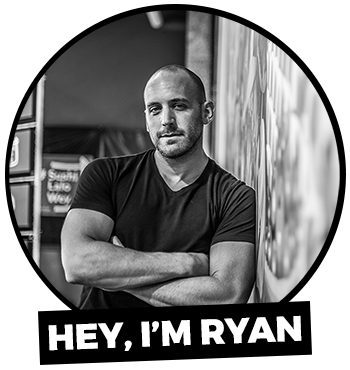 Some vendors might tell you that you need to buy tickets there, but you do not. Simply follow the road for about a half mile (easy walk) until you reach the entrance of the ruins. 3. Tulum admission prices are 59 pesos per person. If the staff (or your tour guide) sees you shooting video as you’re approaching the entrance, they might ask you to pay a $4 fee to use your video camera. Simply tell them you’re not shooting video, and that you’re just taking photos and they’ll leave you alone. 4. GET THERE EARLY! Please don’t make the mistake of arriving to Tulum at 11AM. If you do, you can guarantee that you won’t get one single photo of the ruins without a group of tourists standing in your way. The best time to arrive to Tulum is as early as possible. We arrived at 9:30 and we were three of maybe 20 people in the ruins. By the time we explored, went down to the beach and made a loop around the ruins, we arrived back to the center of the ruins and found ourselves surrounded by hundreds of tourists. 5. Bring your bathingsuit! 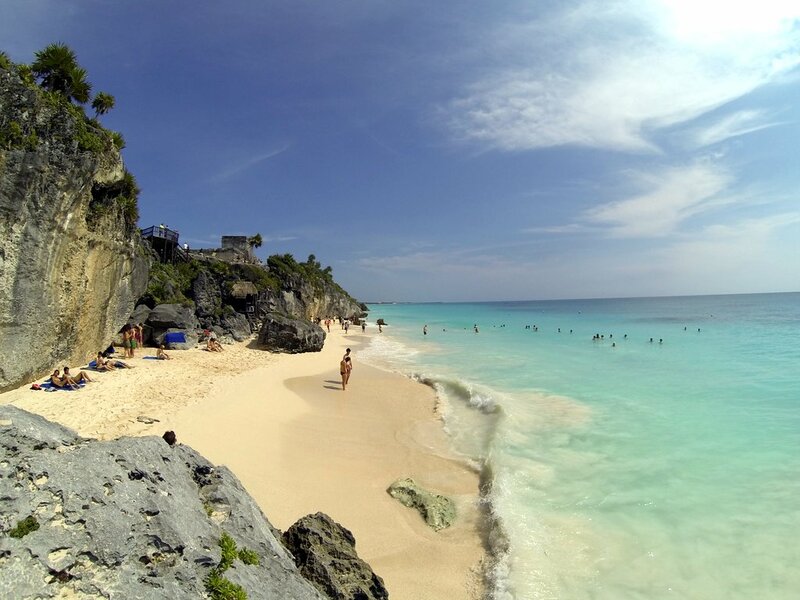 Tulum’s beaches are pristine and they also happen to be some of the most amazing beaches the Yucatan. After you’re finished wandering around the ruins, you can make your way down the staircase leading to a beach that is so damn beautiful, it will blow your mind. 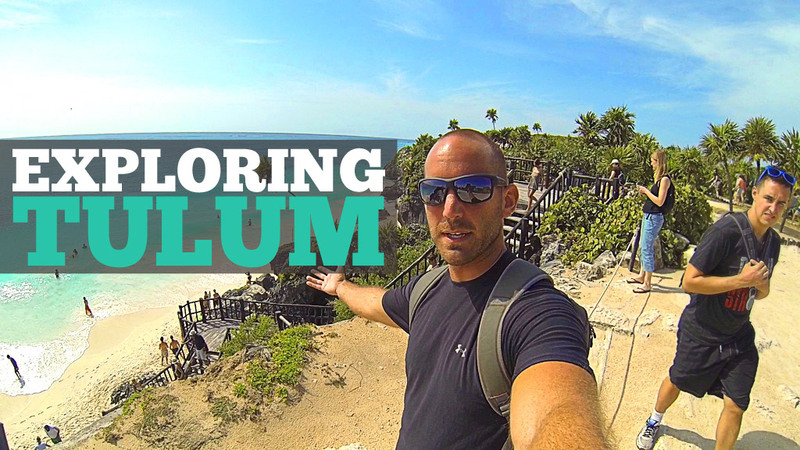 If you’re looking to get a better idea of what the Tulum ruins are like, be sure to watch the video above. If you enjoy this video, please be sure to SUBSCRIBE to my YouTube channel. Did you miss my last video about my visit to a local cenote? 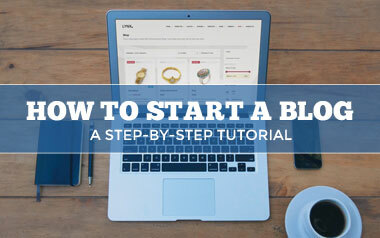 If so, CLICK HERE. Great video! We are in our last week of eight here in Playa Del Carmen and are hoping to squeeze in another visit to Tulum beaches plus a visit to town as we didn’t do it when we went to the ruins. 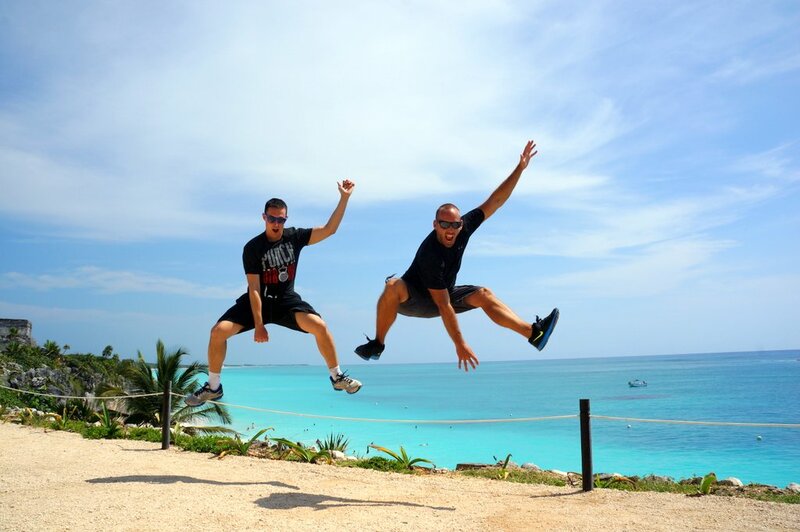 We’re definitely going to miss the beautiful beaches of the Yucatan, you got some great shots of them! 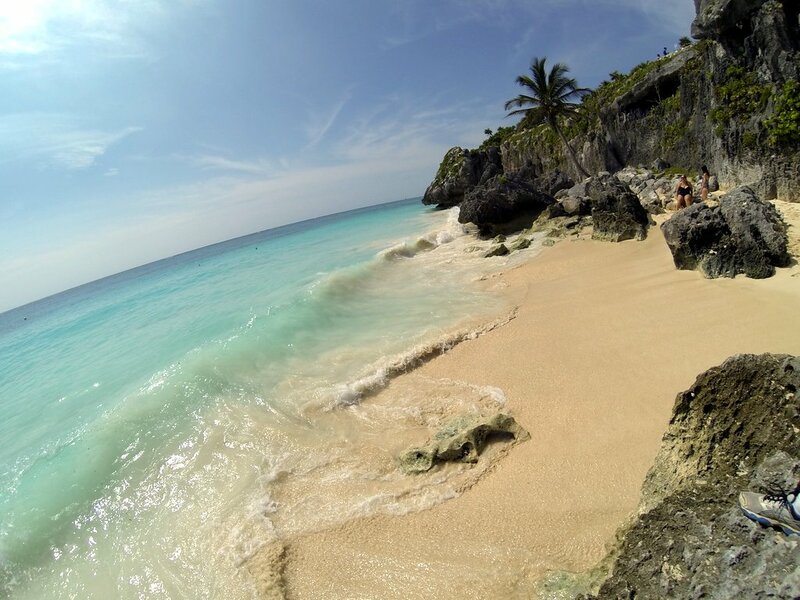 Oh man, I already wanted to go back to Tulum. Now I want to even more. Thanks, as always, for furthering my wanderlust. The combination of vanilla sand and turquoise water looks so inviting. Thanks for sharing. The beaches and ruins sure look worth visiting. Just visited 3 days ago. Struggled for tourist free photos but captured a few good ones, and the beach was so beautiful my friend decided to propose to his girl right there in the water, caught the whole thing on video and it looked great in that crystal blue water. Thanks for the update, Nick! Yeah, it can be tough to get photos without having a few tourists pop in and out of them. You really have to plan it out right and get there as soon as the ruins open in order to get quality photos. Very cool about the beach proposal. That is one seriously beautiful beach! We’re staying at the Grand Sirenis. Sounds like it’ll be easy to get to the ruins by colectivo and save A LOT of money. No problem, Dustin. The only issue with staying on those type of resorts is that they’re usually set back off the highway so you will need to either walk to the highway or ask the resort if they have a golf cart service of some sort to bring you out to the road. They’ll likely tell you not to use the colectivos because they would rather you use their expensive taxi services or a tour but don’t worry. You’ll be fine if you follow my advice.